Water is water, no matter where you are. Let me get this off my system. If you are looking for Starbucks in India, good luck! You can only find the coffee shop in the Airport, departure area. And if you are looking for a freshly brewed coffee, there is no such thing! Everything is instant coffee in India. 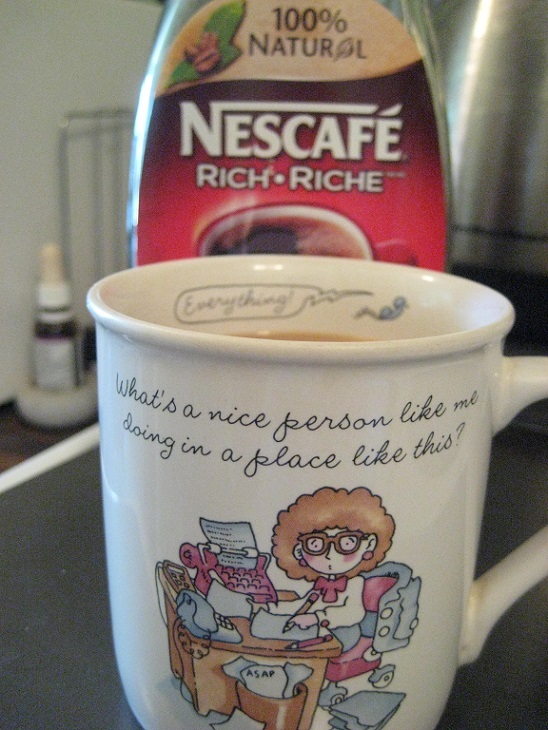 The famous one is Nescafe or Folgers. Kate Crimmins are you rolling your eyes yet? It was a problem, a very big problem for me. But hey, I am a pilgrim, this is not Club Med. Sugar – if you want it sweet. Oh, some make it frothy to give it an espresso look. There’s hardly any coffee in this cup but bubbles. I was kicking myself to get a “caffeine kick” to it. There’s hardly any caffeine in an instant coffee. Drinking two or three cups of this first thing in the morning is my form of “flagellation” for seventeen days to wake me up. I survived. The minute we arrived in Canada, we stopped over at my sister’s place and I asked for a real good brewed coffee, mug size. Aaahhhh…. good to the last drop followed by a refill. I am so glad to be home. A giraffe’s coffee would be cold by the time it reached the bottom of its throat. You only think about yourself. the importance of properly caffeinated.